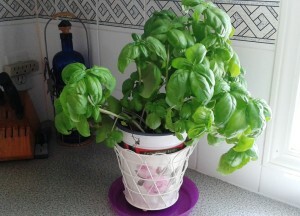 I love fresh herbs and when I saw potted fresh basil being sold at the supermarket I quickly bought one. Wow, what a nice addition to my foods. I love having fresh basil in my kitchen. I particularly like adding fresh basil leaves to my sandwiches. The main reason I bought the fresh basil plant was because I simply like the taste of it and I knew I will be using it a lot. I do not have a “green thumb” so this is a very convenient way for me to have a fresh herb. I have to say I am so pleasantly surprised by all the benefits basil has that I will make sure my little plant stays healthy providing me with a lot of fresh leaves for months to come. Simply rub the basil leaf on your mosquito bite and reap the benefits. It helps with itching, swelling and disinfecting. For this it is recommended you use basil extract. This has the ability to destroy harmful agents and prevent damage caused by certain free radicals. Are you using basil? If so what is your favorite way of using it?